Little do they know that LinkedIn could be their answer to obtaining valuable leads. 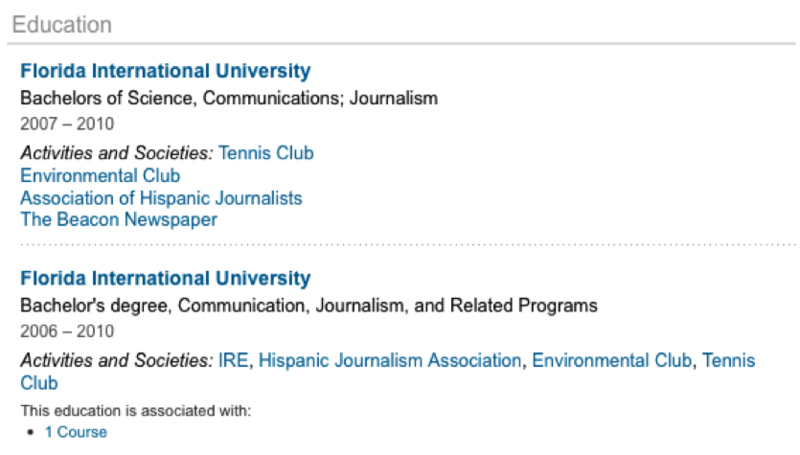 In this article, I will unveil how to use LinkedIn to its full potential. From a polished profile to well-crafted bulk e-mails, get ready to transform your start-up business into the one you’ve always wanted. Let’s start with the basics. There really isn’t much magic here, only basic common sense. Often, we fail to pay attention to small details such as our choice of keywords and even our profile photos. Lucky for you, these are errors that can be fixed with the click of a button (literally). Your profile is probably the most important section in your LinkedIn account. To illustrate, imagine if you were going on a date and you had to introduce yourself. Would you ramble on and on about what you do or would you want to appear clear and concise? The answer is probably the latter. A first impression will determine how others see you. Include a professional profile photo. This does not mean you have to hire a professional photographer. It means that you should choose a picture that shows your whole face with decent lighting. Maybe it’s that extremely formal photo your Grandmother took last Christmas? We all have one somewhere. If in doubt, dress up, place yourself in front of a white wall and snap that photo. Your title should be short and clear. I always find it funny when someone lists 10 things in their title. If you do have 10 different job titles, well maybe you should be in the Guinness Book of Records. Stick to your position and that’s it. If you have several positions/jobs make an additional profile for each one. You may do so by clicking on “add a profile” in your profile page. The profile you choose will have the same information as your existing profile. The only thing that will change is the title. Make it professional but fun. What I mean by this is avoid sounding like a machine. To prevent this, add on any leisure activities you enjoy or trips you’ve taken. Choose your skills carefully. We all have different skills. The goal here is to choose the ones that will help you make connections with potential clients. Also keep in mind that connections may “endorse” your skills, so I would suggest including the skills you use the most at the top. Include your educational background. Many people fail to include this information because they believe it is useless. On the contrary, filling out your educational information might allow you to achieve valuable connections with classmates who share the same interests as you. Once your profile is completed, it’s time to ask for some outside help. What I mean by outside help is obtaining endorsements and recommendations. They say that a recommendation from another person is 5 times more valid than if you were to recommend yourself. If you’re just starting a business, you want to make sure your future customers know you are the best at what you do. Obtaining these recommendations is essential to the outcome of your business strategy. Endorse/recommend one of your contacts. Send a direct message asking for an endorsement/recommendation back. People love to be praised. You are more likely to obtain a response with a good deed. Ask a contact/friend to endorse/recommend you in a topic or choice. If you have close contacts that have used your services/products, feel free to ask them for a recommendation in formal writing. Ask a co-worker to endorse/recommend you. Do this only if you feel they will. Ask a client to endorse/recommend you. A happy client will always come back. Still, a perfect profile and multiple high-quality endorsements won’t really get you the exposure you need. For that, you have LinkedIn Groups. In order to craft a well rounded strategy that will transform your business, it’s essential to make good use of this feature. Find groups with influential people that are willing to have a conversation. Always maintain a flow of conversation through open-ended questions, observations and detailed remarks. Provide something of value such as a free e-book, coupon, study, or tip. Add your connections on Twitter and follow the conversation there as well. Be original. By this I mean: Share your work, studies, and observations. Know your audience. Study your prospects before you enter a group. Respond fast. Don’t let too much time pass when someone asks a question. Be alert. We are almost there. It’s time to reflect expertise on your subject by joining LinkedIn’s Q&A Feature. This tool allows you to either post a question on a subject you wish to learn about, or to answer a question someone else has posted. Depending on how other users rate your answers, you may have the chance to be featured as an expert in your field. This is a great way to build your authority among the LinkedIn community. Finally, discover LinkedIn’s hidden treasure. Choose from a variety of useful apps that can help you locate prospects and build new connections. 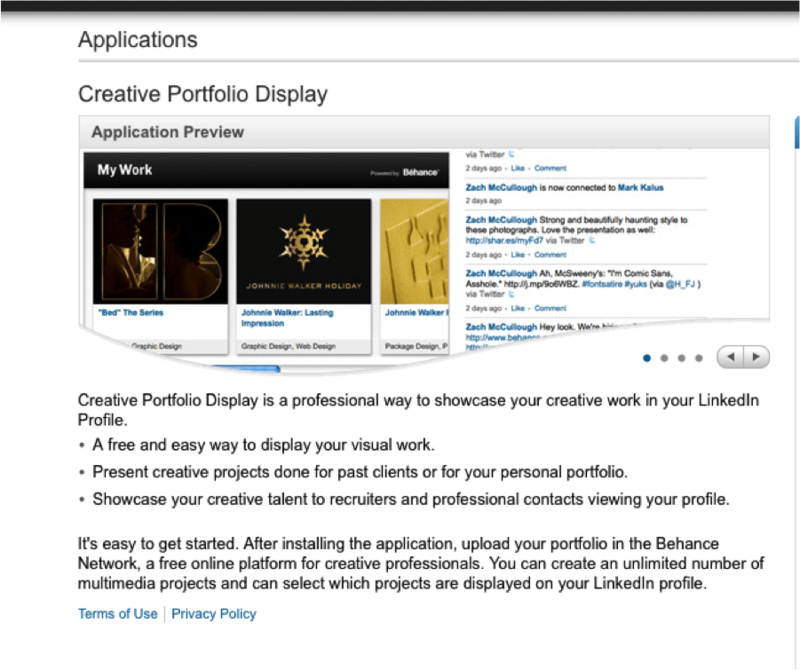 This application allows you to display your creative artwork right on your LinkedIn profile. It’s free, easy and will make your profile look polished and original. Who wouldn’t love an informative Power Point? 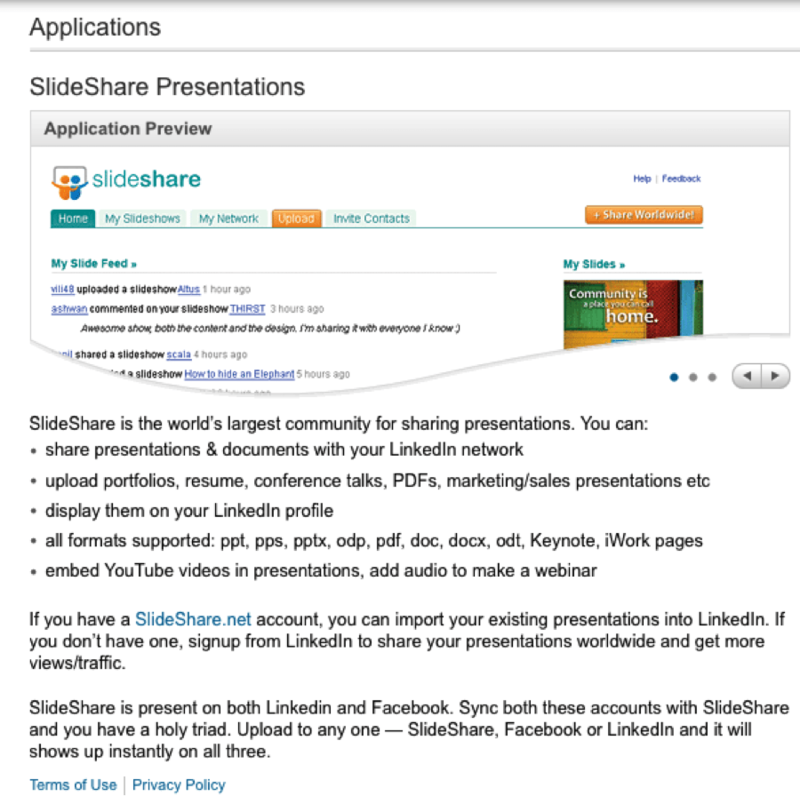 Now, you can have your presentations on your LinkedIn profile with this free application. Wondering what your audience in thinking? 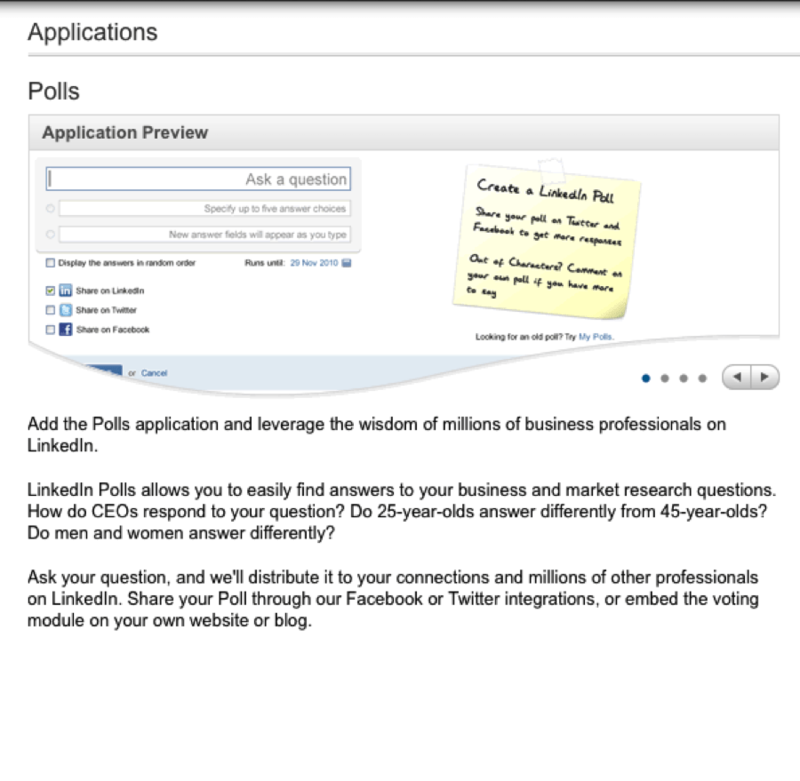 Add this free poll application that will facilitate the survey process for you. Remember to combine this application with LinkedIn’s E-mail Marketing system for best results. Are you a people person? Take your expertise outside of the Internet and communicate one-on-one with influences. 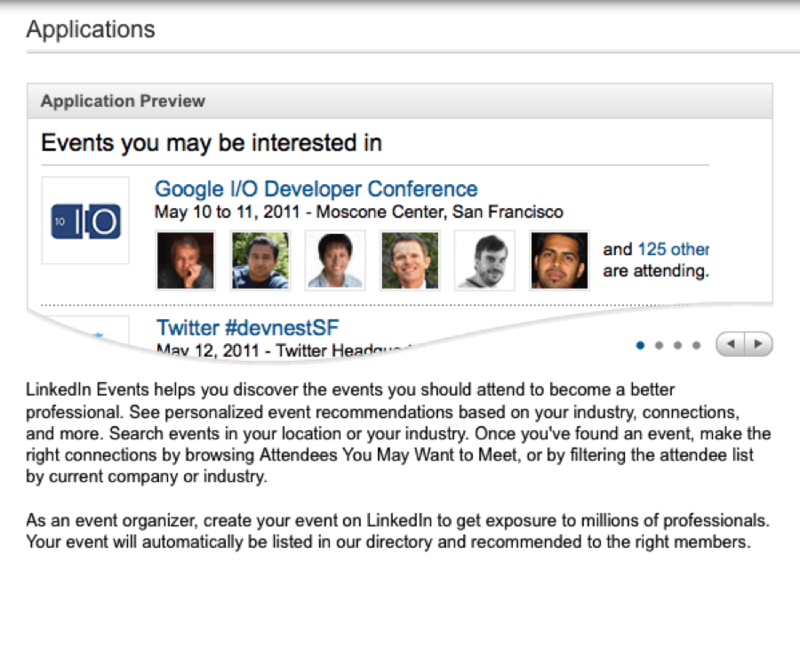 LinkedIn now offers an application that allows you to find local events based on your industry. It really doesn’t get better than this!